As we careen toward November and National Novel Writing Month, here are a couple of other places you can find me this week, on virtual, the other not so much. First, head over to the Speculative Fiction Showcase and check out my interview with them. It’s a great site if you’re interested in fantasy, sci-fi, or the like (and if you’re not – why are you reading this, anyway?) and their questions were different and fun. Check it out. 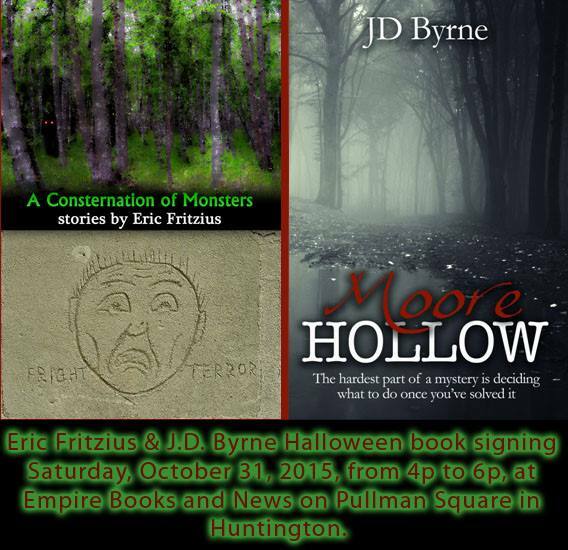 Second, this Saturday – yes, that would be Halloween – I’ll be appearing, along with Eric Fritzius (author of the excellent collection A Consternation of Monsters) at Empire Books in Huntington, West Virginia. We’ll be there from 4-6 pm signing and selling books, and even doing some readings from our books. I’ll try and find a suitably spooky portion of Moore Hollow to match whatever creepiness Eric will come up with.